C. Front rails 3 VaxIVax 14316 in. PHOTO B: Glue and clamp the stats together to form the hack panel. Clamp scrap cauls across the slats to hold Hie panels flat. Apply just enough clamping pressure to close the joints. 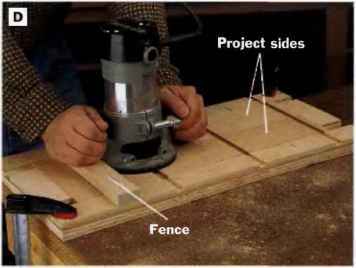 PHOTO D: Create a simple shop-made Jig out of plywood to gang-rout shelf dadoes across the sides. Guide the router base along a removable fence, and rout each dado clear across both the fig and sides. 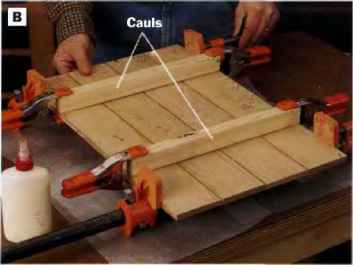 Also clamp a pair of scrap cauls across thy panel to help keep it flat (Sco Photo B). O Create a full-size paper template of the Back Curve Layout, page 237, and use the template to trace the top profile onto the back panel. 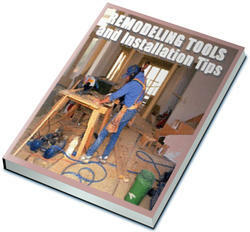 Trim the top profile to shape with a .jig saw (See Photo C). 0 Sand the back panel smooth with 150-grit paper. It's easier to sand this panel now before assembly. © Crosscut the sides to length. 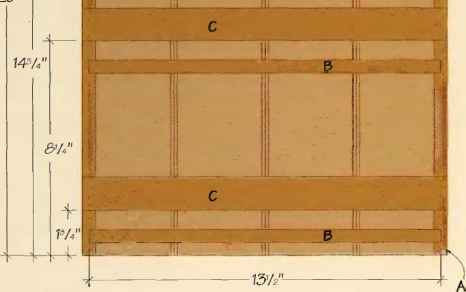 Lay out the shelf dadoes on these workpiecee, positioning them according to the Side Section drawing, page 237. PHOTO C: Enlarge the Back Curve Layout grid pattern on page 237 to make a template for drawing the profile at the top of the back. Cut the profile to shape with a Jig saw. 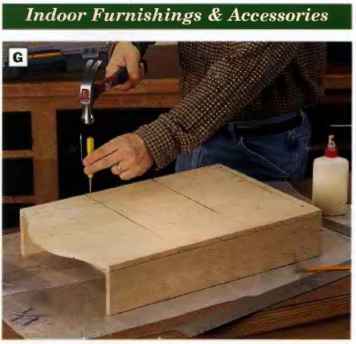 PHOTO E: Spread glue on the mating surfaces of the shelves and sides, and assemble these parts. Note: In this pftoto, the rail notches In the sides are facing down. 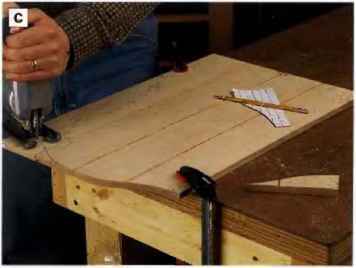 dado grooves across both sides at once with a simple shop-made jig. The jig is comprised of a ?<4-in. plywood panel about 12 in. wide and 24 in. long, sized so that both side panels can lie side by side and flat on it. Strips of t'2-in.-thick plywood were glued (not nailed) around the panel to hold both side panels securely and to serve as back-up support for minimizing bit tearout. We then screwed a fence across the jig to guide the router base for cutting the dadoes. With the jig clamped to your worksurface and the sides in place, rout dado grooves across the full jig and both sides at your shelf layout marks, moving the jig fence accordingly for making each dado cut (See Photo D). PHOTO F: Dry-fit the front rails In their notches in the sides. The raits should fit flush with the front edges of the sides. Once they do, glue and clamp the front rails In the notches. rails. 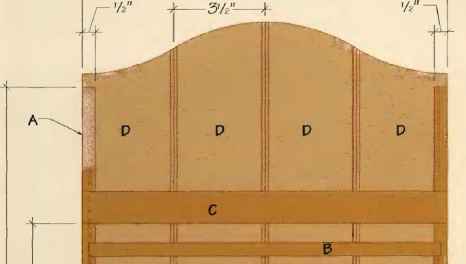 See the Front Elevation drawing, page 237, for marking the notch locations, then carefully cut the notches with a sharp wood chisel. 0 Smooth the sides with 150-grit sandpaper. © Dry-fit the shelves in the side dadoes to check t he fit of the parts. Widen or deepen the dadoes as needed with a chisel and sandpaper. 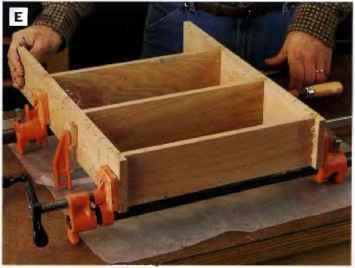 (D Apply glue to the ends of the shelves and into the dadoes, then assemble the shelves and sides with clamps. Tighten the clamps just enough to seat the shelves in the dadoes (See Photo E). © Cut the iront rails to length and dry-fit them in their notches on the sides. Adj ust the fit of the pails as needed by chiseling out more waste from the notches. The rails should fit flush with the front edges of the sides. 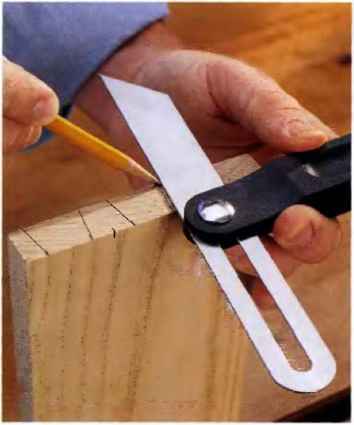 © Spread glue into the notches and install the rails, clamping the parts together (See Photo F). © Fasten the back panel to the project: Turn the project facedown on your worksurface. Set the back in place with the chamfered face down and mark shelf centerlines across the back for locating finish nails. Spread glue on the back edges of the sides and shelves, and set the back panel in place. Install the back with IVit-in. finish nails driven through pilot holes in the shelves and sides (See Photo G). PHOTO G: The back is secured with glue and nalis. Before attaching, mark a line across the back at each shelf to serve as guides for locating the fasteners. Drill pilot holes for the finish nails, and set the heads so they will not scratch the wall once the shelf unit is hung. © Apply the finish of your choice. We wiped on three coats of Danish oil. © Attach picture hanger hardware that will allow the spice rack to hang close to the wall. 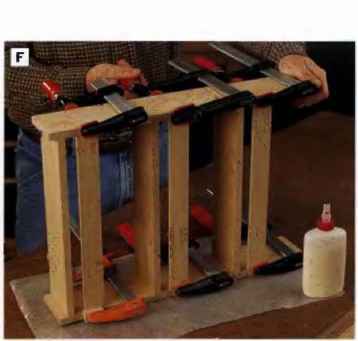 To'build this spice rack as designed, you'll need to buy lumber that is pre-mllled to *A- and ^-In. thicknesses unless you have access to a power planer. 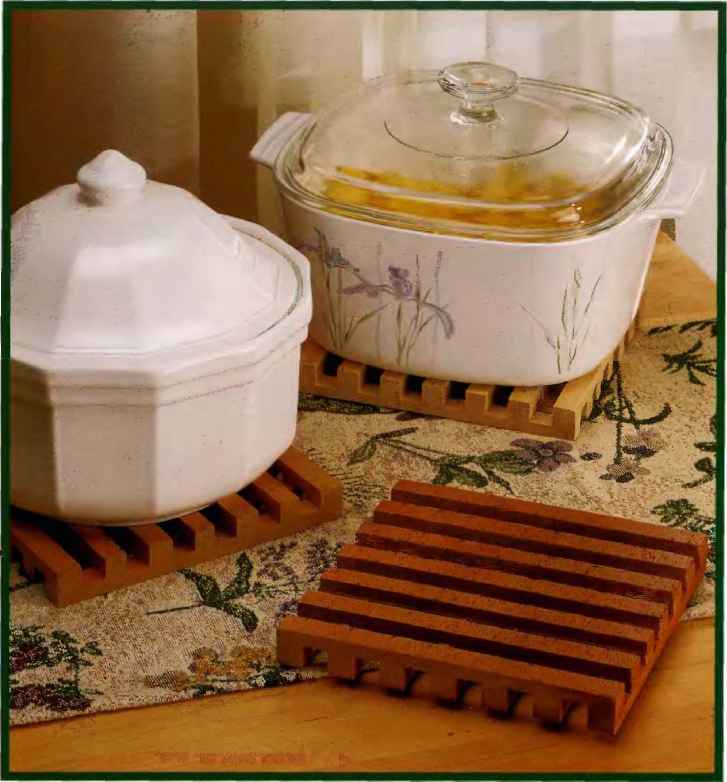 Most home centers will carry a limited assortment of woods milled to these thicknesses, in addition to the usual 3/i-ln.-thlck stock. 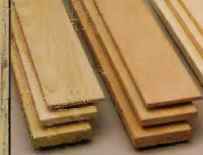 Depending on where you shop, you may find such woodias poplar (A), red oak (B) and pine (0), as well as other woods like cherry, maple and walnut Look in the craft or hobby sections of Hie store to find these specialty thicknesses, and expect to pay higher prices.